One of the segments in our Florida Beach Basics - The Space Coast describes the seashells one is most likely to find on our Brevard County beaches. Seashell is the common name for the hard, protective outer layer created by a sea creature. 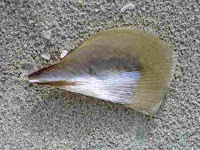 Most shells that you find on the beach are the exterior shell of marine mollusks. The scientific study of mollusks while they are alive is called malacology. The study of mollusk shells and the collection of shells is called conchology. Our friend Cecelia Abbott, shown with her wrack stick in this first photo, is our resident shell expert. Cecelia’s late husband was Dr. R. Tucker Abbott, considered the world’s greatest malacologist, and author of numerous books on seashells. Cecilia and Dr. Abbott traveled the world as part of their research and writing, and Cecelia is a well-known conchologist.